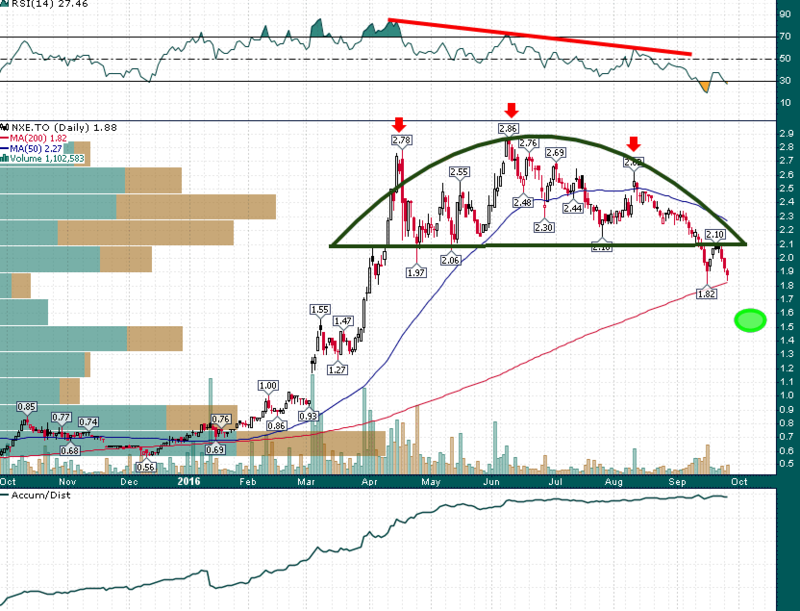 Anatomy of a Broken Chart | Energy and Gold Ltd.
As I have said on numerous occasions, I have no opinion on NexGen’s fundamentals other than to state that the company has a top notch management team and they may be in the worst sector (uranium) in the entire market. I do however have an opinion on NXE’s chart technicals. After surging higher to begin the year NXE made an emotional climax in April and subsequently spent the next four months churning a great deal of volume between ~C$2.10 and ~C$2.80. A few weeks ago NXE shares broke the multi-month range to the downside before finding support near the rising 200-day simple moving average. The oversold bounce lasted for three days and failed at exactly the level which I identified a few weeks ago as crucial support (C$2.10). Previous support becomes resistance. The shallowness of the bounce should be concerning for NXE bulls. Sellers have been in control for months and they are becoming more aggressive in hitting bids in order to release their shares. Below C$1.82 it should be a quick trip down to the C$1.50s. NXE is a broken chart in need of time in order to heal. C$2.10 is a steel plated ceiling of resistance until proven otherwise. DISCLAIMER: The work included in this article is based on current events, technical charts, and the author’s opinions. It may contain errors, and you shouldn’t make any investment decision based solely on what you read here. This publication contains forward-looking statements, including but not limited to comments regarding predictions and projections. The author has no position in NXE shares at the time of writing and no intention to initiate a position, either long or short, in the next 72 hours. Forward-looking statements address future events and conditions and therefore involve inherent risks and uncertainties. Actual results may differ materially from those currently anticipated in such statements. The views expressed in this publication and on the EnergyandGold website do not necessarily reflect the views of Energy and Gold Publishing LTD, publisher ofEnergyandGold.com. This publication is provided for informational and entertainment purposes only and is not a recommendation to buy or sell any security. Always thoroughly do your own due diligence and talk to a licensed investment adviser prior to making any investment decisions. Junior resource companies can easily lose 100% of their value so read company profiles on www.SEDAR.comfor important risk disclosures. It’s your money and your responsibility.